When most westerners think of China, the two most popular cities that come to mind are Beijing and Shanghai. Both are bustling, heavily populated cities with the former renowned for its cultural significance and the latter recognized as a modern-day economic engine and metropolis. However, when my husband and I were planning a two-week journey in China, we wanted to get off the beaten path and away from the big cities. With a pre-planned itinerary from China Highlights, we were able to craft a journey that was truly unforgettable. 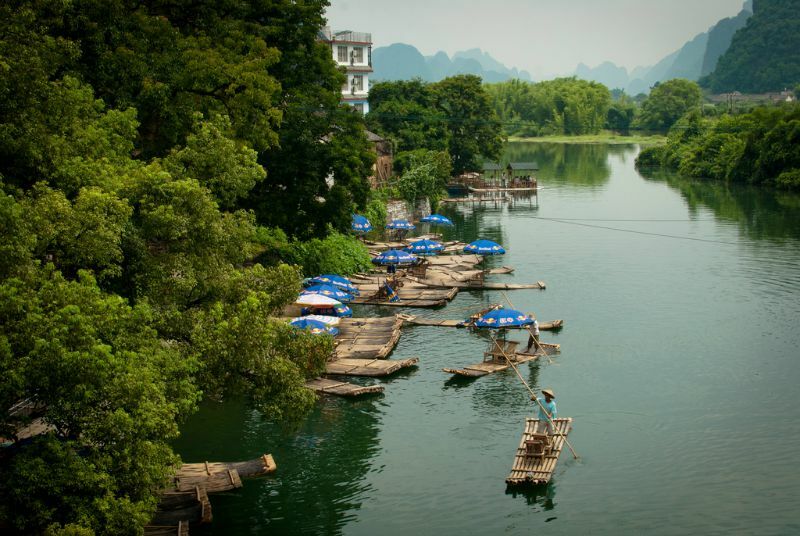 Our journey began in Guilin city, famous for its Karst Mountains, within the northeast region of Guanxi province. On the first day we took it easy, strolling around central Guilin which is lively with people, shops, and small restaurants. 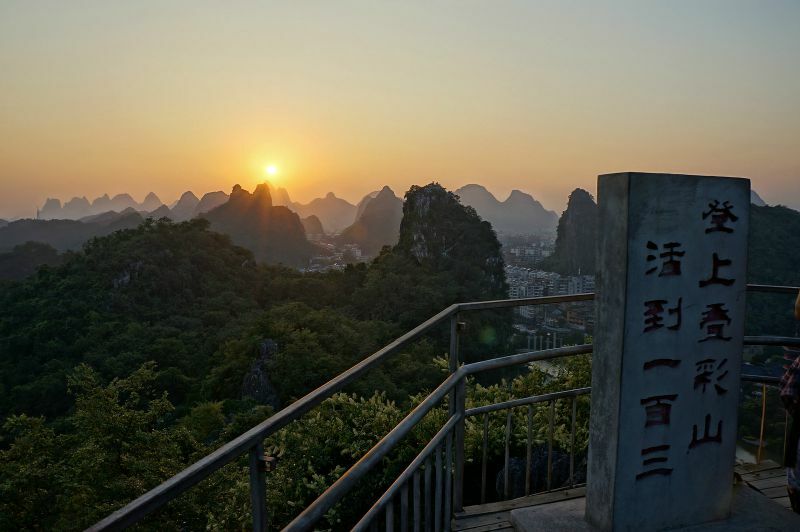 There are also multiple parks, including Riyue Shuangta and the Guilin Botanical Gardens. If you’re an avid foodie and a fan of street food, take a walk along Zhengyang Pedestrian Street, Mong Kong Food Street, and Jiefang Road. For more local fare, dine along Yiren Lu and Nanhuan Lu. Most major hotels in Guilin have a concierge desk from which travelers can arrange day trips, for a fee. 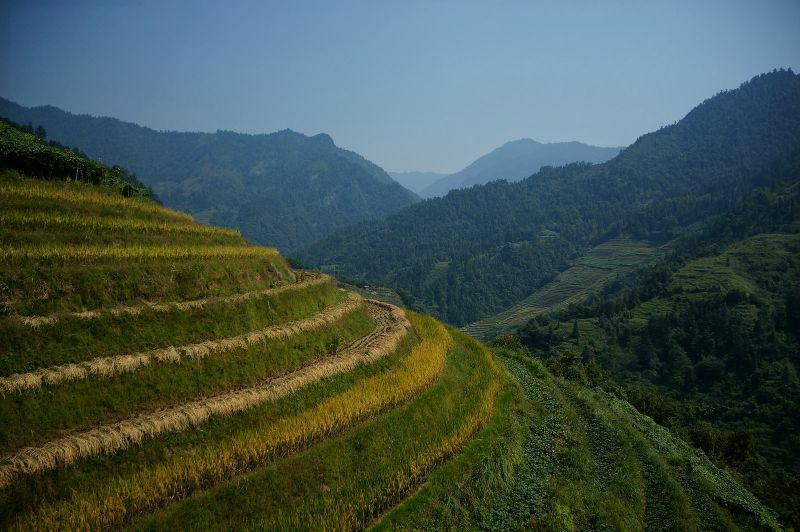 We told our concierge that we wanted to visit the Longsheng (or Longji) Rice Terraces, approximately 60 miles north of Guilin, where we would be able to hike along fields of terraced rice paddies. (The name “Longji” translates to “Dragon’s Backbone” because the rice terraces resembled dragon scales). He arranged for us to get on a tour bus leaving the following morning and we were able to spend about six hours trekking through carefully carved trails that wound around each beautifully manicured rice terrace. As we hiked through the peaceful terrain, we were greeted by friendly farmers, many of whom would prepare lunch for us for a small fee, and sold us rare treats such as crystallized honey to snack on during our trek. On day 3 we took a taxi from our hotel in Guilin 45 miles south to rural Yangshuo, which is surrounded by the Karst Mountains against the backdrop of the Li River, and traditionally a very popular destination for backpackers. If you are a rock climber, Yangshuo is a must, as there are several popular lines for climbers that snake along the Moon Hill arch. However, for non-climbers, such as ourselves, there were still multiple activities to partake in. We floated down the Yulong river on a bamboo raft, biked along the narrow paths hugging the rice paddies, and went on a day hike down the Li River. It was mountains and rice paddies as far as the eye could see! At the end of our stay, when it was particularly hot and humid, we went on a three hour “drifting” trip down the Li Jiang River. This involved rafting down a river teeming with level three and five rapids. If you are looking for an exhilarating and refreshing ride, this is a highly recommended activity! From Yangshuo, we took an overnight train to Lijiang, a city located in northwest Yunnan Province. 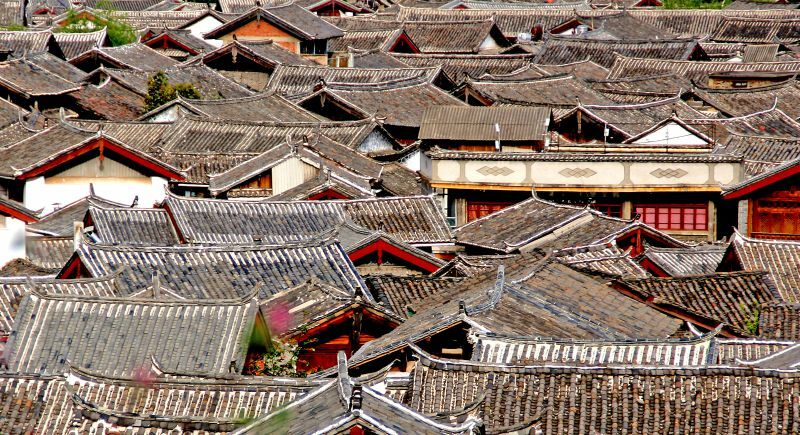 Lijiang, famous for the UNESCO heritage site “Old Town Lijiang,” may sound unfamiliar at first, but if you’ve ever seen a Kung-Fu movie, chances are parts of it were filmed in Lijiang! With a history dating back to the Ming and Qing dynasties, stepping foot into Old Town brings you over 800 years back in time. The best view in town is Lion Hill where a traveler can peer over the Jade Dragon Snow Mountain. Good views come with a price so know that you’ll be climbing up several hundred feet of steps for the pay off. After Lion Hill, we visited the Mu Palace that once housed Lijiang’s ruling family and is reminiscent of, albeit a smaller version of, Beijing’s Forbidden Palace. 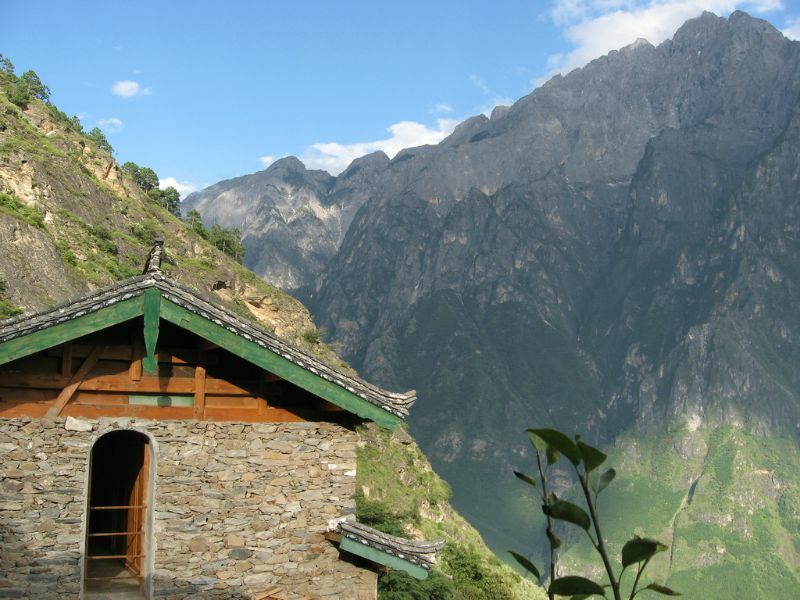 From Lijiang, we took a private coach that drove us about three hours to Qiaotou, where hikers can embark on a two day hike to Tiger Leaping Gorge, a scenic canyon on the Jinsha River (one of the main tributaries of the Yangtze river). As the name suggests, the gorge is famous for it’s rock formation that resembles a tiger leaping across the narrow section of the gorge. Hikers have the option of a lower trail hike or an upper trail hike. If you take the upper trail hike like we did, be prepared for the infamous “28 bends”: 28 switchbacks carved along a very vertical portion of the mountain. On our second day, we descended upon the gorge and climbed onto the Tiger Leaping Rock where we could take awe-inspiring photos of the turbulent waters crashing against the rock. Note: Be careful where you step! The gorge is not navigable and the stream surrounding the rock is at the narrowest point which means high velocity waters and whirlpools. From Tiger Leaping Gorge our coach took us to the nearest airport where we caught a flight to Chengdu. 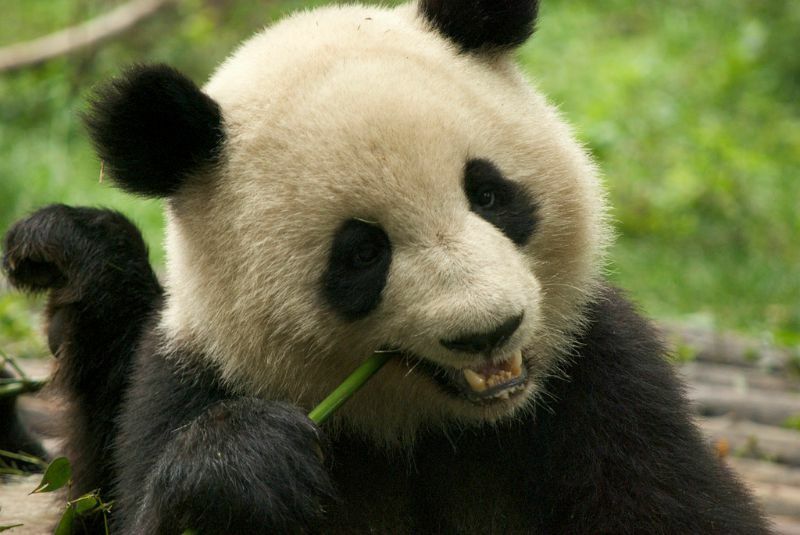 For panda lovers, the Chengdu Panda Base is a must visit. This nonprofit organization is dedicated to research and breeding of Giant Pandas. The park is well designed, the habitats are well maintained, and the park does a fantastic job of educating visitors through exhibits and documentaries translated in many different languages. Located in the Sichuan Province of China, Chengdu is of course known for Sichuan cuisine, which incorporates a generous amount of spicy chilies and peppercorn. Try an authentic Sichuan hotpot meal (Chinese-style fondue with soup), at any number of restaurants in the area. From Chengdu, we hired a guide and a private coach to take us to Emeishan (Mount Emei), located on the Western Rim of the Sichuan Basin. Mount Emei is one of the four sacred Buddhist Mountains in China, and is the tallest of the four mountains. 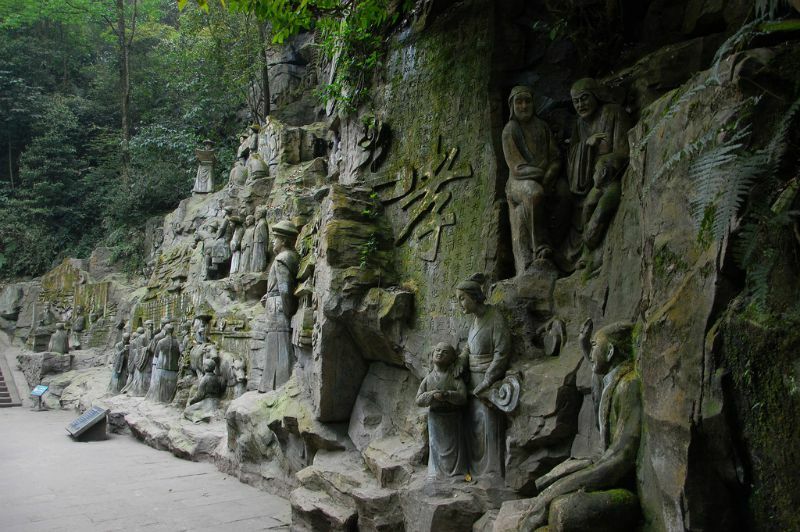 It is also the site of the first Buddhist temple built in China in first century C.E. You can trek up this mountain if you like, but we decided to take a sky lift that took us straight to the summit. In addition to the gorgeous views of the surrounding countryside, we explored several Buddhist temples around the summit. Side note: beware of the monkeys! They have learned that tourists mean food and may get aggressive in order to obtain it. From Emeishan, our guide and private coach took us to Leshan. 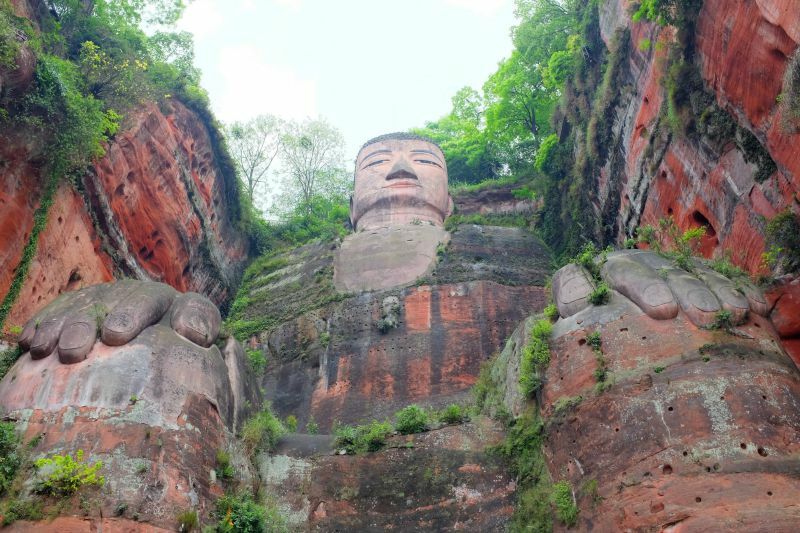 This is the home of the Leshan Giant Buddha, built during the Tang Dynasty and the largest Buddha in the world at 71 meters tall, and a breathtaking site for any history buff. The monk who overlooked the entire project, Haitong, believed that the construction of the Buddha would help the safe passage of ships along the confluence of three rivers, Min, Qingyi, and the Dadu. From the shore of the river, we boarded a ferry that took us across the river for a closer view of the giant Buddha, and then docked at the foot of the statue. We were then given a couple of hours to wander with our guide around the Leshan Buddha Scenic Area, another UNESCO Heritage World site. From Leshan, we took an overnight train west to Chongqing, one of five national central cities in China and according to the census, the most populous municipality in China. 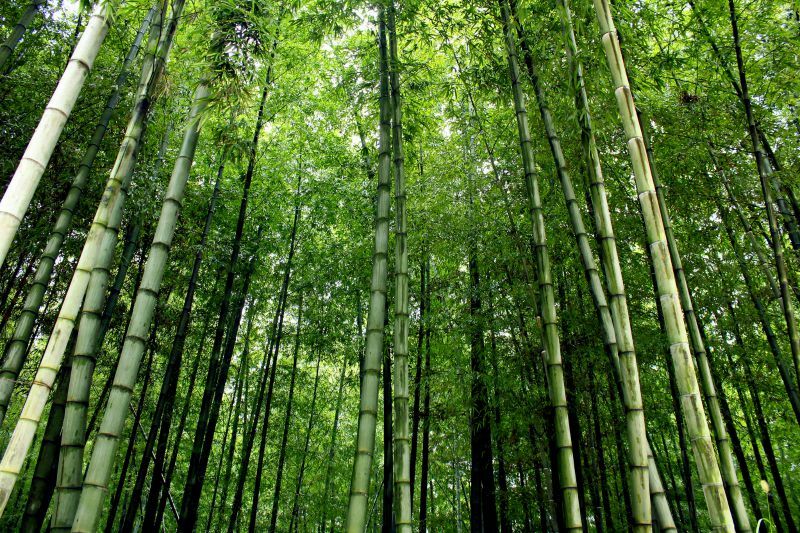 In Chongqing, we hired a private guide to take us for a day trip to Chashan Bamboo Forests, located in the Yongchuan district, 40 miles from the city of Chongqing. Among these giant, towering bamboos is where unforgettable scenes from movies such as "Crouching Tiger, Hidden Dragon" and "House of Flying Daggers" were filmed. Take a hike along a paved trail through the forest and up towards the peak of the mountain ridges where you have an amazing view of the surrounding towns. 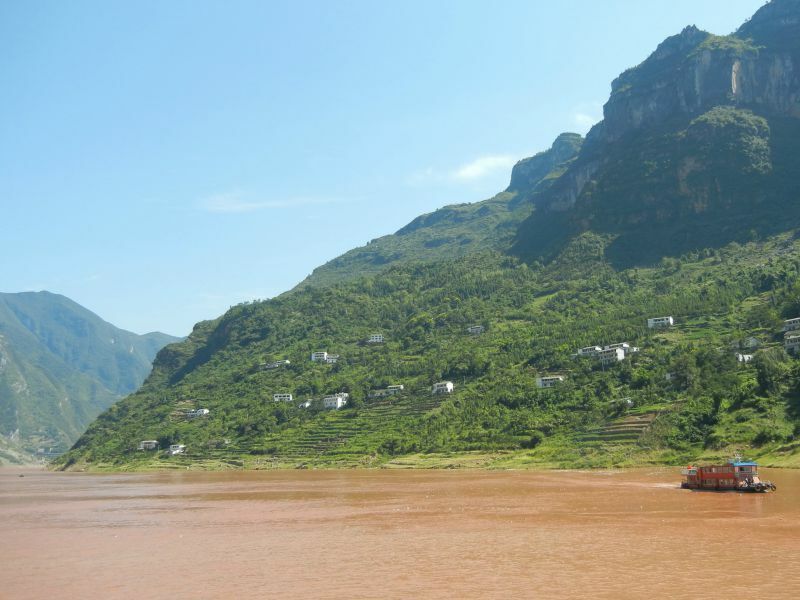 On the last leg of the trip, we decided to take a break from all the trekking and take a river cruise along part of the longest river in Asia, the Yangtze. Aboard the Victoria Lianna we sailed from Chongqing to see one of the Chinese government’s most ambitious and prized projects: the world’s largest operating hydroelectric facility. The Victoria Lianna makes an honest attempt to make westerners feel comfortable. There was a separate dining hall for westerners who preferred western over Chinese cuisine, as well as a “western liaison,” available to answer questions during the trip. This trip is perfect for travelers with a zest for adventure, an eye for beauty, and a genuine appreciation for culture. A journey is always what you make of it, and China Highlights helped make ours unforgettable! Decide on your travel style: opt out of activities and relax, or seize every day for what it can be worth. Most importantly, stride on and travel beyond! Did this trip sound exciting, but daunting to plan? Check out these tours from top companies you can find on Stride! China On a Shoestring tour from Explore! I climbed Mt Emei just yesterday! When the monkeys closed in on us and started snarling and grabbing our bags I said "I'm sure they won't actually attack us, we're fine"- I'm glad I hadn't read this comment beforehand!! Ailish I'm glad you didn't get bitten. Hope you had a clear view when you got to the top. We were shrouded in cloud. Still awesome though. This makes me want to go back to China. Was there in '99, which feels like a lifetime ago, and didn't get out of the big cities. Would love to explore countryside and do some climbing/hiking, as well as visit Szechuan region.